In its 40th anniversary season, Dance Umbrella opens appropriately with New York’s Big Dance Theater in a production of 17c directed by choreographer Annie-B Parson. Its inclusion in the program is both a sign of the intelligent and risk-taking selection process that characterises this annual festival and of the diverse strands that define contemporary dance. Parson’s choreographic approach to theatre cannot easily be pigeonholed, although the inspiration of Pina Bausch’s dance theatre is evident. As she says in the program interview, ‘Having been immersed in the prosaic, structural, and virtuosic pedestrianism of the early Judson Church dance-makers and second-gen Judsons, I was intoxicated by Bausch’s use of dance in relation to costume, sexuality, relationship, scenario and character.’ Parson’s development of the Bausch legacy diverges distinctively from other European examples, and it is indeed refreshing to see her New York take on dance theatre on a London stage — too little seems to cross the Atlantic these days — and the Old Vic, once the second home for Sadler’s Wells Ballet under the stewardship of Lilian Baylis, is an ideal setting for it. On a structural level 17c is a reading of selected entries from the seventeenth century diary of Samuel Pepys as if it had been selected for a monthly book club meeting, probing what a contemporary reader might find or relate to in the author’s unashamed accounts of his daily routine. Although the diary is very much a product of another time, it turns out there is a lot that is surprisingly contemporary, from health concerns and pillow talk to sexual dalliances and outings to the theatre. Such obsessive detail in a diary inevitably draws comparisons with today’s social media confessional culture. It goes without saying that Pepys as a prominent civil servant — he rose to be Chief Secretary to the Admiralty — would not have survived long in the current #MeToo media environment and yet his diary’s prosaic descriptions of his sexual exploits betray not a whiff of compromise. It is this transposition from 17c to 21c and back that gives the production its dynamic and its satirical sense of humour, as if Saturday Night Live was broadcasting an episode from Restoration London. Parson almost immediately places us in a simulacrum of a seventeenth century television studio by turning Jeff Larson’s video cameras on the audience to project back a vision of us seated in an intimate auditorium waiting for the play to start. Five bewigged characters in flourishes of elegantly tailored costumes (by Oana Botez) flit across the high-production stage (courtesy of Joanne Howard and Joe Levasseur) mixing archaic prose with contemporary idioms as if literary phraseology had imploded in a mash-up of innuendoes, cross-references and quotations from Euripides to Judith Butler and from the muted 17th century playwright Margaret Cavendish to Roland Barthes. Central to this treatment of Pepys’ diary is Parson’s championing of the lost voice of Pepys’ wife, Elizabeth (Bess), whose own diaries had been burned by her husband in a fit of pique. 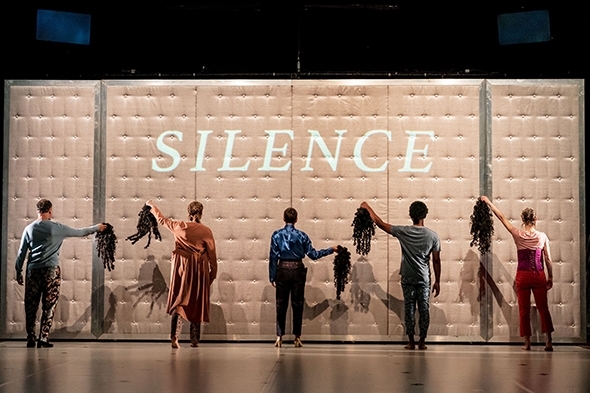 Since we cannot read her, Parsons brings her to life in movement through performer Elizabeth DeMent. As a choreographer working in theatre Parson says in the program, ‘I believe strongly in both the supportive and poetic power of structures that stem from dance-making tools that are unique to choreography, forms that can hold both a narrative and an unrelated ongoing movement piece at once, allowing the two elements to collide and resonate with each other.’ Invoking Bess through her body rather than through her voice may seem like a small concession to a dance audience in what is a heavily texted and scripted work, but it is also one of the more obvious concessions in what is essentially a choreographic treatment of time and place. One of the happy ‘collisions’ in 17c is between the presence of Bess as a dancer and Pepys’ commentary in his diary of his wife’s decision to learn how to dance and how, characteristically, he becomes jealous of the dancing master, especially when Bess requires another month to study with him. ‘A gentleman never dances so well as a dancing master’, Pepys wryly comments. In effectively illustrating a historical narrative while invoking the current consciousness of forgotten female voices Parson borrows from theatrical devices to create an awareness of our present. As a choreographer she uses a wide-ranging sense of spatial and temporal movement to influence the more theatrical aspects of 17c, maintaining an ambiguity of form that makes a case for the ongoing development of dance theatre.